Stephen McDonnell’s Town side stand as one of only four clubs to have left Windsor Park with anything in the current league campaign following November’s 1-1 draw. Warrenpoint Town's Simon Kelly (right). Pic by INPHO. The Blues prepare to tackle Warrenpoint bolstered by an unbeaten run stretching back nine fixtures but Healy accepts the need to maintain focus. 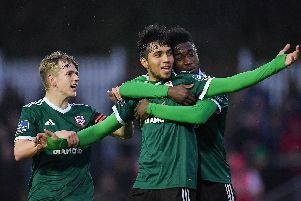 “They deserve a lot of credit for how they’ve gone about their business this season and for where they are at the minute,” said Healy on the club’s official website. “They have shown that, not only in the draw against us at Windsor Park but in other results this season, beating the likes of Coleraine, Glenavon and Cliftonville. Warrenpoint picked up a point from the last city visit to halt a run of back-to-back Premiership defeats and that boost in confidence sparked the start of a five-match unbeaten sequence. Recent form has also offered cause for optimism as Warrenpoint can call on happy away-day memories across January in league and cup at, respectively, Glenavon and Institute. “Last week’s cup win was a positive result but it will be a very tough match at Windsor Park,” said Warrenpoint captain Simon Kelly on the club’s official website, in response to the Irish Cup victory. “However, we will be hoping for another positive result like we got on our last visit. “It’s brilliant to get through to the next round of the cup and, hopefully, we can go on a cup run this season. Linfield have been linked with a loan move for Northern Ireland under 21s international Kyle McClean from St Johnstone. Healy has confirmed loan deals involving two current club names - with Jonathan Smith off to Ards and Eamon Scannell extending his Warrenpoint Town stay.